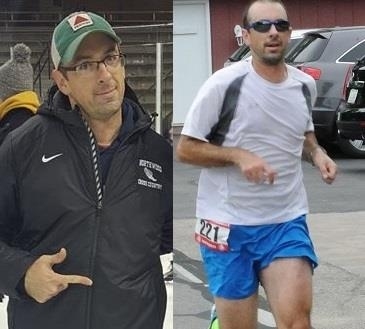 This week’s Two Rivers Running Member Shout-Out goes to Adam Polhemus. Adam’s running journey began in February of 2001 out of boredom when he decided that he wanted to get fit. He started out playing basketball but after two sprained ankles, he decided to try running. Adam started running as a kid here and there growing up because his dad was a runner. Adam’s weekly running schedule is about 20 miles in the winter and 30 miles during the summer. He mostly runs in the evenings in and around Nappanee but likes to go to Bonneyville Mill, OxBow, or Hoke Farm when he has the time. While Adam considers himself both a trail and road runner, his heart is on the trails. For cross training, Adam enjoys biking….and eating! His favorite post-run snacks are pizza, watermelon, and orange juice. Adam’s favorite race is the Thankful four on Thanksgiving day in Nappanee (“Go ‘Wood!”) and his best race ever was the 2011 Two Rivers Meet 15k with 4th place at 59:36 min. Adam is looking forward to seeing his kids enjoy running in 2017. Welcome back to the club, Adam!